Garbage disposal is a must have in any household. When it comes to handling waste and trash, it is important to make use of the available technology to make things easier and more convenient. But just before you finally decide to buy a garbage disposal, there are essential considerations. You don’t just buy any unit as long as it can grind waste. Depending on your specific needs, you can choose which garbage disposal. Most importantly, you have to scrutinize the Garbage Disposals Brands. When it comes to buying a garbage disposal, price is not the only primary consideration. You have to get to know more about the manufacturer, the materials used, the features, and other specifications to make sure that it is exactly the kind of unit you want. InSinkErator is considered to be one of the top global brands. Starting out small in Wisconsin, the brand has further expanded in over 80 countries across the globe. The company was founded by John W. Hammes. An architect by profession, his business ideas stem from practical innovation. As part of the Emerson brand, they are one of the world’s biggest manufacturers not just of garbage disposals as well as hot water dispensers that are designed for both commercial and residential use. They invented the products in 1927. After so many years, they have further expanded and developed their products by integrating advanced technologies which include anti-jam, anti-vibration, powerful grinding, low noise, etc. To date, the brand employs about 1,000 people all over the world. Their mission is to make sure that customers get to have efficient garbage disposals that are equipped with the needed features and specifications. Their products are available in various location. Customers may opt to purchase InSinkErator online or they can also find on in locations nearby their area. By using InSinkErator products, consumers get to help the environment as these products are designed to make sure that there is proper waste management and conserve natural resources. InSinkErator is based in Racine, Wisconsin. But their products are being sold all over the world. Every year, the brand manufacturers millions of garbage disposals which only show that they are one of the most trusted business brands in the industry. Proper waste management is one of the many concerns and households. When you just have too many items to throw away or even small pieces of trash, it can be challenging in some ways especially when you know that you cannot just throw trash everywhere. But thanks to garbage disposers, you can now set aside that worry. It is now just a matter of finding the right you need that can meet your specific needs. With a wide range of options available, it helps that you get to know more about the business brand first and how did create the units so that you know what to expect. Top rated and well-known brands are not just popular for nothing. People who have already bought their products would attest for the kind of garbage disposers they make. A brand that has a broad range of garbage disposers to choose from, Waste King is a must try. The units are manufactured by Anaheim Manufacturing Company. Their garbage disposers come in different models. Depending on your requirements, budget, and other preferences, you can simply choose which one you like. The units vary when it comes to horsepower capacity as there are some garbage disposers that are designed for heavy-duty use. The strongest unit is the Legend Series 8000 which comes with a 1HP motor capacity. This product comes with lifetime warranty. Another unit with the same horsepower capacity is the Batchfeed Top control 8000. Other models come in 3/4 HP, ½ HP, and 1/3 HP. 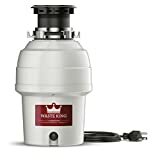 If you are looking for different options, Waste King might have what you need. They differ in specifications. But all of their units are made from stainless steel components that are not prone to corrosion. They are very easy to use and the brand also offer long warranty coverage compared to other brands. In any household appliance or device that you want to use, buying a product from a trusted brand is a sure way to get a reliable unit that you can use at home. The same thing applies whenever you want to purchase a garbage disposer. For some people, they might think that going for the cheapest price is the best option. In reality, you need to consider the brand and the way how they manufacture the products. Since you will be spending, it’s just a logical that you go for a brand that can give you a powerful, affordable, and highly efficient garbage disposer that you can use to grind waste. KitchenAid is a trusted brand not just in the United States as well as in other parts of the globe. Whirlpool Corporation now owned the company which started in 1919. Over the years, the business brand has successfully developed and manufacturer kitchenware and other products that are designed to meet to growing demand for innovative, efficient, and affordable products for kitchen and household use. Their garbage disposer is also considered to be a good buy. The brand offers garbage disposers and compactors depending on your requirements and budget. These units vary in horsepower which means that the grinding capacity differ. They have models that have higher horsepower which can easily grind variety of scraps. While for households that don’t need such feature, they also have affordable garbage disposers. The units’ specifications may vary. But all of these products are created in such a way that it can handle food waste. By using garbage disposals, you never have to worry about kitchen waste clogging your mean. They can get rid of different kinds of kitchen scraps. The garbage disposers are easy to use and they do not create loud noises. Having a garbage disposer makes everything efficient. Instead of worrying how to manage and handle waste, you can now use a garbage disposer. When it comes to selecting one, there are several options available. From inexpensive to pricey units, you can choose which one best fits your needs. But price is not the only main consideration. You want your unit to last. And so you must find a quality brand that is known to create garbage disposers that are built to last. In the world of consumer electronics and appliances, GE will always be part of the top rated brands all over the world. Also known as General Electric, it is an American multinational company based in Massachusetts with branches all over the world. The company was founded by Thomas Edison, Charles A. Coffin, Elihu Thomson, Charles A. Coffin, and Edwin J. Houston. Founded in 1892, the business has earned its reputation to one of the world’s leading brands. From consumer electronics to service solutions, they constantly innovate and find ways to meet the growing needs and demands of the market. Products and services that they offer include: appliances, electronics, gas and steam power, hybrid power, software, industries, and applications. Known as a brand that creates quality and reliable products, they also make one of the best garbage disposers. Using the latest advancements in technology, customers can easily choose which garbage disposer unit to purchase. Their disposer comes with powerful motor so foods do not get clogged or jam. All of their products are designed to provide ease of use and convenience to consumers. With EZ mount installation, consumers will not have a hard time in installation. GE has several garbage disposals designed that have varying features and specifications. Offered at reasonable prices, customers get to have a product that is built to last, a unit that is manufactured from one of the best brands in the world. Proper handling and management of waste can sometimes be a problem in households. But thanks to technology, it is now made easier and more efficient with the use of a garbage disposal. With the different brands and models to choose from, it can be quite challenging to choose which one of them is the best buy. This is where the importance of going for a reliable and highly trusted brand that can give you exactly the kind of quality garbage disposer that you need. Among one of the most reliable brands that offers both style and functionality is Moen. Based in Ohio, the company was founded by Alfred M. Moen until it became part of the Fortune Brands Home and Security Company. The business offers a broad range of products including fixtures and faucets. They also have different garbage disposals that are all designed to reduce jam. Depending on your preference, you can simply browse the collection of garbage disposers. The features and specifications of the units vary depending on which model you want to purchase. Some units may have 1/3 to 1 horsepower motor capacity. All of the garbage disposers that they sell have outstanding feature including the use of Vortex Motor that gives strong power to effectively grind waste, universal XpressMount to make installation much easier, and it also comes with a power cord. The brand offers garbage disposers that have high horsepower. These units can grind different kinds of kitchen scraps. With the brand’s Sound Shield feature, their units operate with less noise and you can barely notice that they are in use. In terms of performance, they guarantee that all of their garbage disposers are designed to give consumers performance that they can trust. For every purchase, customers get to have limited warranty coverage that comes with in-home services. When finally getting your own garbage disposal, you don’t want to take chances simply because first you don’t want to waste money and second, you want to invest in a unit that can help you with proper waste management. Emerson is a well-known brand that produces garbage disposals along with other electronic products that are used all around the globe. It is a multinational corporation that is based in Missouri, United States. Employing hundreds of thousands of individuals with hundreds of manufacturing locations in different parts of the world, the brand continues to provide a wide range of consumer products that are designed to provide residential and commercial solutions. The brand’s garbage disposal is considered to be one of the top rated units not because the brand is popular. Their waste disposal units are known to be reliable and highly functional which are the top considerations of consumers. Every model is designed to cater to a particular kitchen style. You get to choose which garbage disposers you need. When it comes to price, the units that they offer are reasonably priced in such a way that customers actually get the most of what they for. There is a wide range of garbage disposer depending on individual needs. They vary in prices, technical specifications, and features. Anchored on the business principles that aim to provide innovative and quality products, they cater to both residential and commercial clients. Joneca Corporation, the maker of WasteMaid food waste disposers, is a must try brand especially if you are looking for a reliable, functional, and quality garbage disposer. Founded by Edward Chavez way back in 1985, the company has further expanded and is now specializing in providing household appliances and residential kitchen solutions which include garbage disposals. In partnership with Anaheim Marketing International, the business brand continues to reach out to its customers from other parts of the global by offering their products to more than 50 countries. The brand offers different models to meet the varying needs of their customers. Although they differ in terms of specifications, the brand ensures its customers that all of their units are efficient. They are easy to install as they feature Speed Master Mounting which is a specific type of system that makes it a whole lot faster to install. The components used in making the garbage disposers are corrosion proof which guarantees you that it does not easily corrode. While using the unit, you get to have maximum torque, giving enough power to grind waste and reduce potential jams. In terms of the design, the garbage disposers are lightweight and compact making it easy to install even in narrow spaces. Garbage disposers are designed to make it faster and easier to grind waste for proper waste management. When getting your own unit, there are so many things that you have to factor in. One of which is the brand. You want to get a garbage disposer that is produced by a reputable brand, something that you know can last and worth your money. Among one of the rated brands selling garbage disposers is Premier. For more than 25 years, they have been producing a wide range of household products for kitchen and bathroom. Their mission is to provide quality and reliable products that meet the growing needs of customers. With the reputation that they have established over the years, they have successfully developed other products. They are known for durable and functional garbage disposers that are equipped with powerful motor and other must have features needed in the household. To date, they have two models of food waste disposer: 143053 and 143052. The 143053 comes with 1/3 horsepower which fast-lock mounting system. Other essential features include sink flange made of steel, galvanized elements, and it also comes with disposer elbow and hardware kit. The other mode, the 143052 has a ½ horsepower. It has almost the same features with the previous model. One of the main differences is that its power is not as strong as the first one. But when it comes to features like fast-lock mounting system, galvanized elements, stainless steel sink flange, etc., it is not far from different to the first one. As they constantly innovate to create products that do not just meet the needs of consumers as well as complement the styles of homes, they get to manufacture products that are worth the purchase. If you are looking for a value for money and dependable garbage disposer, you can never go wrong with this brand. KitchenEater is just one of the many brands that sell garbage disposers. The brand is considered to be one of the highly rated brands simply because they also have amazing features that people need in a garbage disposer. In choosing this brand, customers are guaranteed of an efficient and quiet garbage disposal that is easy to use. What separates them from others is that they use high-power motor capacity that easily grind any kind of waste. Depending on the model you want to purchase, the specifications vary. The components that they use for their units are stainless steel and are resistant to rust which means that you get to have a unit that is built to last. Installing the garbage disposer is also made convenient. When it comes to operation, the brand guarantees that it produces less noise with its sound barrier feature. It has a sound insulation which gives you quiet operation as it grinds the waste. The brand offers lifetime in-home warranty. This is a good warranty coverage which is different from other brands as other online offer warranty for a certain period of time. From affordable to heavy-duty garbage disposer, you can easily choose which unit to get based on what you need. The horsepower capacity of the units varies depending on the model. Garbage disposals are widely used not just for commercial use. Households now invest in having their own garbage disposer is as these units are very efficient and they help to ensure that waste and other trash are handled the right way. Just before you finally decide to get one, it is very important that you need to take the time to get to know about the brand, model and specifications of the product. Popular choices are not the best choices in all cases. In the end, you will have to sort out your options depending on your budget and your personal preferences. Franke is considered to be one of the top choices when it comes to garbage disposers. They are a global provider of products for residential use, coffee preparation, public warehouses, etc. The brand specializes in kitchen systems, foodservice systems, and coffee systems. Based in Aarburg, Switzerland, the company employs more than 9000 people. They are operating in 5 continents exporting to more than 100 countries. The business brand is owned by Artemis Group. When it comes to waste management, they offer more choices. They offer waste management solutions to help people get rid of their waste in the most efficient way possible. With their garbage disposers, you don’t have to leave them in the bin anymore. Depending on the kitchen style and personal preferences, you can choose among the different models of garbage disposers available. The business brand offers a garbage disposal for every kitchen style. To date, they have 5 models that are specifically designed to help homeowners get rid of clutter and other types of waste. All units are equipped with high-powered motor that can grind waste into really fine particles for easy waste management. Their garbage disposals also have antibacterial protection to get rid of odor.